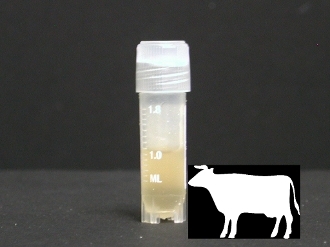 Synovial Fluid Collection: Bovine synovial fluid is collected from the metacarpalphalangeal joint (“knuckle”) of skeletally mature cows. Fluid is snap frozen and kept at -80oC until shipping. The fluid is shipped frozen with dry ice for overnight delivery. Volumes: 10 ml, 50 ml, 100 ml, 500 ml, 1 L. For other volumes, please inquire. Stifle Joint: Alternately synovial fluid can be collected from the stifle joint (“knee”) for an additional procurement fee. Stifle joint synovial fluid is collected “per joint” with no minimum guaranteed volume. Most stifle joints contain ~1.5 ml of synovial fluid. *Product not available in all countries. Please inquire.